I've had to tweak my grocery spending just a little, to reduce our grocery bill, with our new income. I've slightly changed my thinking on how I stock our pantry. I am now approaching this task as if I were stocking an institutional kitchen. I already buy the bulk of my grocery basics at a wholesaler that caters to restaurants and institutional kitchens. But wanting to save BIG on groceries, then shopping like a restaurant on some items, seems to be the way to go. Restaurants don't buy teeny tiny boxes or cans. So, for a few of my items, neither will I. United Cash and Carry was my choice, as I it's close to home and doesn't require membership. Back in the day (18 years ago), they were strictly cash and carry, no credit, no personal checks. Today, our local store takes credit, debit, cash and business checks. Many of the packages are black and white, no enticing colorful images. No product placement of name brands at eye level, and off-brands up high or down low. Nothing, really, to lure you into buying something just on impulse. And certainly not much that a toddler in tow with me, would have whined for. Some of the same big names that you find in mainstream grocery stores are also found at restaurant supplies. For example, the oats I buy (in a 25 pound, plain paper sack), are Bob's Red Mill. They carry Hunt's tomato products in #10 cans (those cans that hold almost a gallon). I buy Darigold Butter in 30 pound cases. For greatest savings, I often choose one of their house brands, First Street and Simply Value. What you won't find at an institutional cash and carry is an entire aisle, dedicated to colorful boxes of cold cereal, or chips and crackers, or cookies. They do have those items, but they take up very little of the warehouse foot print. There is no Starbucks in the store, nor sample ladies (although, I have seen vendors with samples on two occasions). While they welcome any one with cash in hand (and they take credit), their primary customer is a small restaurant owner/chef, or, someone planning a large event for their social or work group, or, a small cafeteria cook. Very few "soccer moms" shop here. There is no unit pricing on the shelf, so I always bring a calculator. I have a good memory for regular store product prices and standard sizes, so I can make my comparisons in my head. Someday, when I can no longer remember product prices, I'll likely bring a price book, for the items I buy there. So, how do the prices stack up? I'll give you what I paid in common unit pricing, at the cash and carry, and compare it to what I would have paid, if I bought in smaller quantities. Vegetable oil: My normal is to buy 1 gallon at a time. This month, I bought a 35-pound container of vegetable oil. It was $24.17. I used my empty, 1-gallon oil jug, and refilled it with oil from this new container. This requires a steady arm, funnel and 4-cup measuring container with a sharp pour spout. I poured the oil from the 35-pound container into the 4-cup measuring cup. Then poured that into the gallon container. 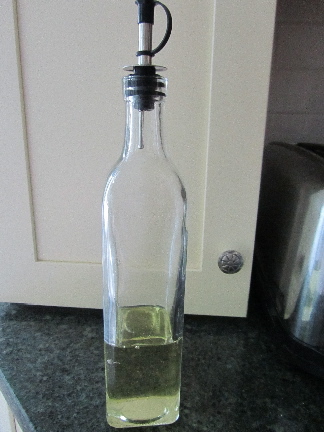 I also keep a small bottle of this oil on the kitchen counter, for quickly adding oil to food prep. I've once before bought a 35-lb container of vegetable oil. 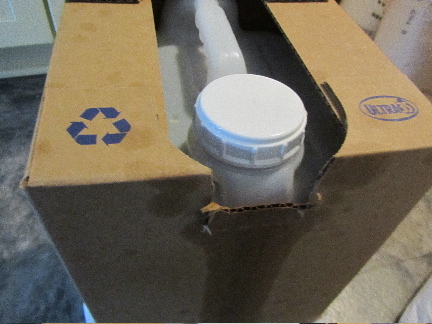 The oil kept just fine, but it was a hassle to manipulate the large box/jug. A 35-pound box is equal to 4.37 gallons. At $24.17, my purchase came out to $5.53 per gallon. The price on vegetable oil in a 1-gallon container was $8.27. I saved $2.74 per gallon, or $11.96 on the 35-pound container. This size is a 6-7 month supply for us. If this sounds like we go through a lot of oil, consider that we cook and bake almost everything from scratch. I use vegetable oil in baking, cooking, frying, salad dressings, bath oil, furniture polish, and hot-oil hair treatments. And I've been considering making soap, using some of the vegetable oil in that process. It's important to know that oil can go rancid. Most vegetable oils have a shelf life of between 6 and 12 months. Cool storage is imperative to get the longest life from oils (below 72 degrees F. 55 degrees F is considered ideal for oil storage). Our pantry is quite cool from mid-September through April (about 66 degrees F). But still, I'll be storing most of this in the fridge, in well-rinsed 1-gallon vinegar jugs. Refrigeration can retard spoilage of many types of oils. Storing oil in a dark location will prolong the life of oils. 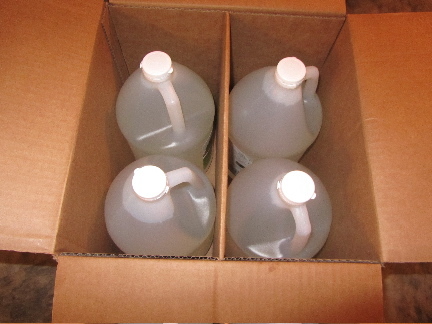 Fortunately, this oil came packed in a cardboard box that is usable as its storage container. The type of oil matters as to how long it will keep, as well. I bought soybean oil. Soybean oil is one of the slower-to-spoil oils, not the slowest, but slower than many. Canola and corn oil (two other very common vegetable oils), spoil more rapidly than soybean. Canned tomato paste: My normal is to buy 1 #10 can at a time. 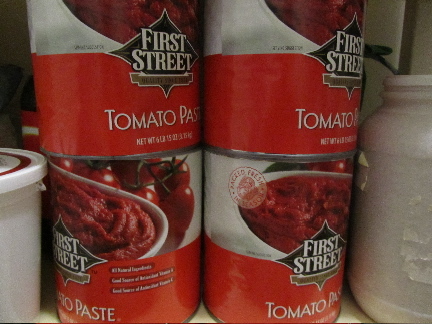 A #10 can of tomato paste is 6lbs 15oz, or the equivalent of 18 & 1/2 small 6-ounce cans of tomato paste. Buying 1 of these #10 cans, at the regular price of $4.99, is like paying 27 cents per 6-oz can, which in itself is a very good price for tomato paste, in my area. These #10 cans are also sold in cases of 6, for $26.65, which works out to $4.44 per #10 can, for a savings of 55 cents per #10 can. This brings the cost per 6-oz use, to 24 cents. The case of 6 #10 cans is about an 8 month supply for us. I use tomato paste in pasta/pizza sauce, homemade tomato soup, added to other soups and beef stew, Tex-Mex dishes, and now in our own homemade ketchup. On this purchase, I saved $3.29 buying the case, over buying 1 large can at a time (my usual). Long grain brown rice: My normal is to buy one 25-pound sack at a time, at about $12.79. Not a bad per pound price at 51 cents/pound. We actually do eat a lot of rice in our house. It's the one grain that I can count on being able to eat, with my food issues. I grind it into flour for some of my non-wheat baking. I use it to make homemade rice milk (for my dairy intolerance) for cooking with. And we have rice with meals about 3 times per week. 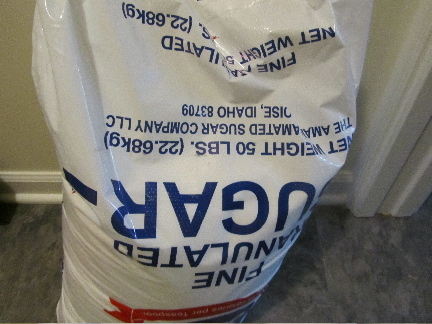 So, this month, I went ahead and bought the 50-pound sack. I've only bought this size one other time, and it lasted about 9-10 months. This much grain needs to be cycled through a 24-hour freezing, in 1-gallon plastic containers, to insure no pests have hitch-hiked. The 50-lb sack was $22.78, or 46 cents per pound. I saved $2.80 by buying the 50-lb sack, instead of the 25-lb sack. 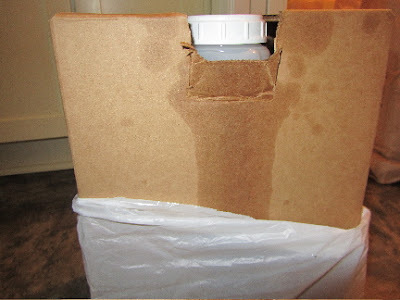 White vinegar: My normal is to buy 1 gallon of white vinegar at a time, at $3.37/gallon. 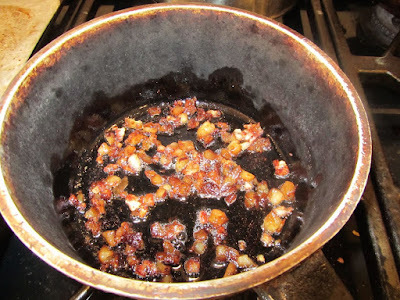 I use white vinegar for cleaning, hair rinse, cooking, pickling, salsa making, homemade ketchup and teriyaki sauce, salad dressings and as a cheap substitute for the acid part of quick bread leavening agents. I go through 1 gallon every 2-4 months, depending on whether or not it's pickling, seasoned vinegar or salsa-making season. This month, I decided to buy the 4-gallon case, at $11.29. This works out to $2.82 per gallon, or a savings of about $2.19 for the case, over buying just 1 gallon at a time. Yellow onions: For most of the year, my normal is to buy a 25-pound sack of onions. Late summer I usually buy a 50-lb sack, as I use quite a few in pickling and making salsa. 50 pounds will last us through Christmas. I keep most of them in the fridge. (See why I need that spare fridge in the garage?) I triage the onions when I get them home from the wholesaler, picking out the ones that need using or freezing immediately. The rest go into the drawers in the fridge. 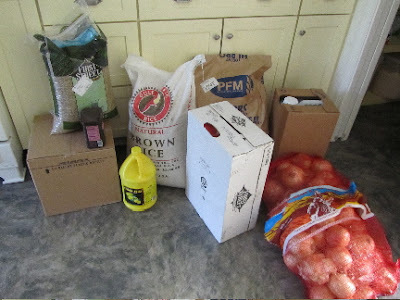 A 50-lb sack of onions in late summer sells for $8.95 at the cash and carry, or 18 cents per pound. I love onions. A favorite side dish is grilled onions with a pinch of salt and dab of butter. I also bought a 25-lb sack of lentils ($12.89), a 50-lb sack of whole wheat flour ($19.18), and a 50-lb sack of granulated sugar ($19.25). But these are normal sizes for us, so no new savings here. You may be interested to know, pinto beans are generally the least expensive dried beans for us, around $18 or so for a 50-lb sack. Green lentils and green split peas follow at around $12-13 for a 25-lb sack. So, these are the beans we consume in greatest quantity. I like to have one other type of bean, just for variety. Sometimes it's black beans, sometimes garbanzos, sometimes small white beans. I rotate between those, but they are priced around $20 for 25 pounds. While at the wholesaler, I priced cocoa powder in the 5-lb bag (a size I used to buy). But Trader Joe's cocoa powder, at $2.49 for 9-ounce container is still a better price per pound than the cash and carry's 5-pound bag. And popcorn, in the 12.5 pound bags were about 79 cents per pound, at the cash and carry. Although we've been out of popcorn for a while, and it is a good, inexpensive snack food, I passed this month. 79 cents per pound is too high for my price point on grains (around 50 cents per pound). I knew I would find it on sale at a local grocery store this fall (common sale time for popcorn in our area). And I did. Yesterday I found it for 55 cents per pound in a 32-ounce bag at a nearby grocery store. I bought several bags. This month, shopping with the idea of buying institutional sizes, I saved $20.24 over what I would normally spend with my usual stock-up method (based only on how I changed my shopping, meaning my savings on the first 4 items on this list). That savings right there, is half of what I need to shave, to make my grocery budget reduction of $40/month. Woo hoo!! My husband and I won't always be able to go through these large quantities. There will come an empty nest time for us, too. At that point, I see two scenarios. One, my kids continue to come home and shop mom's pantry. Or two, I find a few friends who want to form an informal co-op with us, and we can cost-share these large sizes. Shopping in these large sizes is not a one-size-fits-all thing. Many people don't have the storage space, or couldn't use it all before it went bad. Some people just don't like to have all that much on hand at any one time. I understand that. Maybe you just found some entertainment value reading this. or maybe you're cheering me on, in my pursuit to reduce our spending. For whatever reason, I hope you enjoyed my shopping ramblings, today! You are a woman after my own heart! I do the same with oil and I buy sugar in 25 lb bags. I buy bread flour which I is with my whole wheat and all purpose flour this way, too. I cannot buy whole wheat in bulk so I end up ordering it every two years and grind my own flour for it. I love the big bags of rice, but can only find white of various kinds. I don't buy tomato paste in number 10 cans but I do buy diced tomatoes for salsa in them and I buy ketchup in large containers and repackage. you highlighted a very compelling reason to shop in bulk -- lack of stores nearby. Being in a rural area, your selection of places to shop must be severely limited. And I can believe the cost for shopping locally for one weekend, being so high. Without competition, there aren't the huge loss leader deals. And with only one store, you can't just shop the specials. So for you, the answer really is to buy bulk. Have you checked Amazon's prices on bulk purchases? (I think I remember you saying you have ordered in bulk from them before). I have a friend who orders the large sacks of grains in bulk through them. She gets a better price on gluten-free oats this way, than if she shopped the specialty market in the area. I haven't ordered grains from them, but I will definitely check into it. Thanks for the tip. Oh, we can't find beans in bulk so I order them when I order my wheat. I have considered buying wheat berries to grind myself. I may do that sometime. It may not yield a big savings, as I can buy whole wheat flour in the large sacks for a good price, but the flour would be fresher. My best guess woud be the flour is cheaper in bulk....for me I would have to buy it 5 lbs at a time from Walmart. However the wheat can be used for more than just bread...some great grain salads. 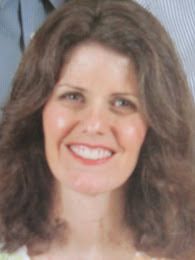 Ramblings, schmamblings, I really enjoy your blog, your frankness, and your sharing. Keep up the good work! After you mentioned oil for a hair treatment and vinegar for a rince I'd like to read how "Hair care" looks in your household. It does sound like I need a pair of salad tongs to style my hair, doesn't it?! I use about 1/2 teaspoon of veg oil, mixed with 2 tablespoons warm/hot water, in a bottle, shaken well, just as I step into the shower. I put the oil/water on the lower 2 inches of my hair, and work through. Then I shampoo. Not all the oil comes out of the ends, but a bit stays on. I have very dry hair, and the ends can look quite dry as a result. The little bit of oil, keeps them looking healthier. The vinegar is about a teaspoon in a cup of warm water, as a final rinse, after light conditioner. It makes my hair shinier, and supposedly keeps my added color looking nice, longer. when all my kids lived at home, I did major bulk shopping too -- one of my fondest moments was hearing my youngest son commenting that "whoever it is who refills the mustard jar is my hero". Now that they're no longer at home, I pick and choose what I purchase in bulk -- they do tend to shop in my basement so I do continue stocking up on many of the products that they use e.g. toilet paper. Keep up the terrific efforts~! That memory is priceless! I sometimes get a sort of similar comment from a family member, when they are overjoyed that I've bought a large supply of a favorite, like popcorn. Ahhh, sometimes people are so easy to please! I know you discussed this before, but how much does running the extra refrigerator figure into the savings of buying in bulk? I'm just impressed that you are able to use up all of this stuff before it goes bad. That was something that I had to do the calculations on. I had the spare fridge unplugged for over a month. I was hoping to keep it unplugged until Nov. 1. But we simply had too much garden produce/foraged berries to keep in the freezer side, to not plug it back in. My daughters gave it a good cleaning on Saturday. My son and husband moved it further away from the garage door to the driveway (where it could get too cold to operate effectively). And my husband leveled the feet on it, so the door would have the best possible seal. I'll have to see how this affects the electric bill. I am still hoping to buy a newer unit. Ha! I think that's fantastic, and I really wish I could take advantage of this since it seems like such a good deal. Alas, I'm not able to eat that much of anything before it goes bad. I'm still trying valiantly to finish a bag of brown rice that I got at Costco about a year ago! My dad got one of those giant 35 pound containers full of dishwashing soap at the salvage store a few years ago. He was very disappointed that it actually ran out! I think he thought he'd have enough to last the rest of his life! Living alone is one of the scenarios that doesn't work well for such large packaging. Large sizes really work well for families. But do you know where you do better than large families? With store limits on sale prices. This always bothers me, that me shopping for a family of 5, still only gets to buy 2 pounds of butter at the supermarket, at the sale price. 2 pounds is about a 3 week supply for our 5. A single person, also has a limit of 2 at the sale price. But 2 pounds of butter could last a single person 2 months or more. It's just never seemed fair to me. So, you benefit on sale limits, and I benefit on institutional sizing. I like your calculations! I wonder if, in the months ahead, your kids will still eat all their meals at home (or packed from home) or if they will use their spending money to eat out more. It's great that you are thinking ahead to sharing orders with neighbours. Well, they have used some of their money to buy occasional treats, like a stop at the downtown See's Chocolates. So far, though, I think they are keenly aware of how hard they worked to earn that money, and don't want to part with it for anything trivial, or that they could get from home for free. We'll have to see how they are in the future. You just never know! With just 2 of us here, I have to pick and choose what I buy in builk. I usually buy my Kleenex at Costco by the case ... that's worked out well in terms of price. Buy the very large size of detergent there, too. We have Gordon Food Service here, which is an institutional food seller that is pushing into the retail market. Some of their prices are very good; in other cases, I do just as well at Costco or Aldi. I shall have to check them for vinegar. It sounds like you've figured out what works well for the 2 of you. I do think you're right, about some prices at cash and carries being great, but on other items you can find better deals, elsewhere. I'd sure like to be able to do a cost comparison with Costco on the items I normally buy at the cash and carry. YOu continue to inspire me - and whilst I don't comment as often as I'd like (seeing I can't access your blog at work, where I sometimes prefer to sneak a comment!) Tomorrow I'll post about my grocery spend, in a lot less detail, but you're really teaching me a lot, and I'm trying to emulate some of the really healthy and thrifty things you're doing! I don't comment a lot on other blogs, either. For me, it's a matter of time. If all I have time to do is read other blogs, than I'd rather read, and not comment, than read fewer blogs. I was reading your post on your grocery spend for August. I think by tracking what you're doing, you will find the areas that you can reduce and those areas that just aren't compromise-able. You and your BF are new to this combined household, so give yourself a bit of grace. I'll post on some of my grocery shopping follies soon, and you'll see what a learning process it was for me. Your post has inspired me to try shopping in bulk to save even more than I am right now. Your blog is so interesting! My family is putting up with my changes surprisingly well. My 17 year old son was worried our laundry would smell like a salad but you can't smell the vinegar when the clothes come out of the dryer. I made homemade deodorant for myself last week and it works great! I used coconut oil, baking soda and arrowroot powder (can use cornstarch instead). I haven't sprung this one on my husband and two sons yet. I'm not sure I can get them on board as they think they need the aluminum anti-perspirant. I haven't missed it. That is great! I haven't tried making my own deodorant yet. But maybe someday I will. If I make soap this winter, I'll definitely post how it goes. And if you make castile soap, please let me know how that goes. I'm very interested. For using vinegar as a cleaner, the orange, or orange and cloves really does smell better. I can still detect the vinegar smell, but the orange and cloves seems to be the dominant fragrance. And, even when I'm out of that concoction (which by the way will last for months, once strained, in the cupboard. I just this last week opened my last jar of last winter's infused vinegar), plain vinegar only seems to smell while it's still damp. Once it's dry, I don't smell it. It is funny how dependent our society has become on all these commercial products, which really have only been around for about a century!